Yang Jin, Mao Xian Jing and Yang Tao are detained at the Manila Police District headquarters following their arrest yesterday. 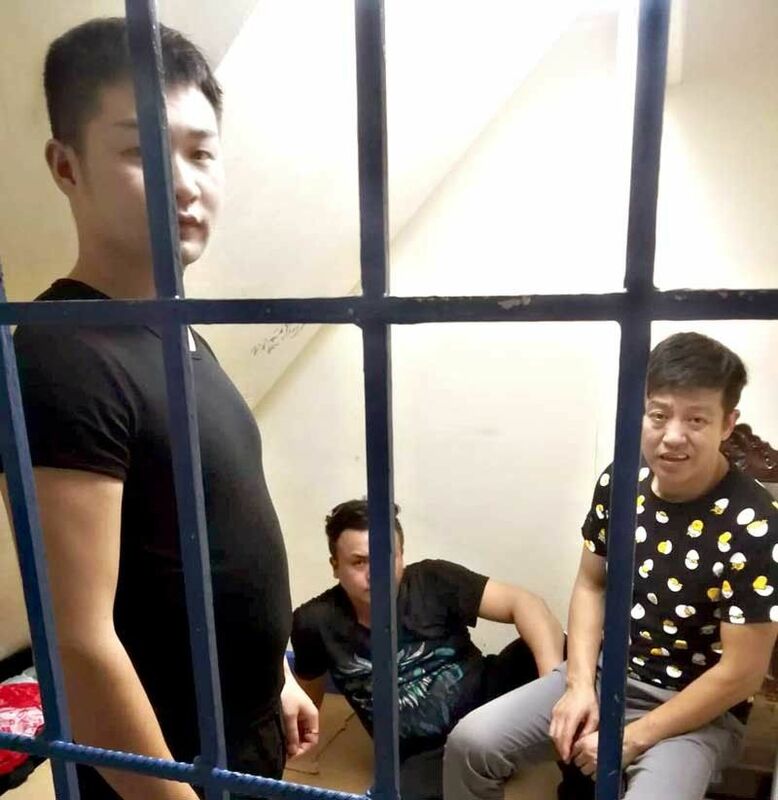 MANILA, Philippines — Six Chinese believed to be members of a loan shark syndicate were arrested and their Chinese victim was rescued by operatives of the Philippine National Police Anti-Kidnapping Group (AKG) in Parañaque City on Wednesday. AKG director Chief Superintendent Glenn Dumlao said the suspects were nabbed at a casino hotel along New Seaside Drive at around 5:30 a.m.
Police rescued Zhu Yan Qing, 28, who has been held by the suspects since Nov. 28. The suspects allegedly demanded 500,000 renminbi from the victim’s family in exchange for his release. Police identified the suspects as Wan Hualong, 40; Xiao Yong Shi, 33; Jian Hu Xiong, 29; Chen You Peng, 30; Xiong Ai Guo, 41, and Wi Jinghong, 40. Charges of kidnapping for ransom and serious illegal detention will be filed against them before the Department of Justice. The victim’s friend sought the help of the AKG after the suspects allegedly detained Zhu when they failed to pay P3 million, which they lost in the casino. Police said they recovered from the suspects three blank promissory notes, two promissory notes signed by the victim and other personal belongings. In Manila, three more Chinese were nabbed yesterday after they allegedly kidnapped a fellow Chinese. They were Yang Jin, 27, of Elcano street in Binondo; Mao Xian Jing, 45, and Yang Tao Tao, 29, both of City of Dreams, Pasay City. Senior Inspector Henry Navarro, Manila Police District general assignment and investigation section chief, said the suspects allegedly kidnapped Hehuan Huang, 31, on Dec. 2. The victim’s wife told police that Hehuan was brought to a safehouse in Cavite where he was allegedly beaten and forced to sign a document transferring ownership of the Soho supermarket located along General Luna street in Ermita, Manila after failing to pay his casino debts. Police said Hehuan did not own the store and was only a worker. On Monday, Geraldine Eleanor Zheng, owner of the store, called the police after Yang arrived and claimed that he is the rightful owner of the establishment. Police immediately sent a team and arrested Yang. During interrogation, the suspect revealed that Hehuan was held in a hotel in Pasay City. A follow-up operation led to the rescue of the victim and the arrest of the other suspects in Rizal Park.